I almost stepped on a lizard yesterday. I didn’t mean to, I just didn’t see him. I’m usually pretty good at spotting wildlife, I mean if there’s like an elephant or a tiger someplace, I’m often one of the first to identify it… especially if there is a placard right next to the cage. I didn’t see the lizard because he was the same color as the sidewalk I was traveling on. What’s interesting is that as soon as he squirted across the pediment, he changed color upon getting to the grass. He changed color again when he “matched” the wall that he ran up to escape my oppression. While the fact that lizards can change color isn’t headline news zoologically speaking, it did get me thinking. 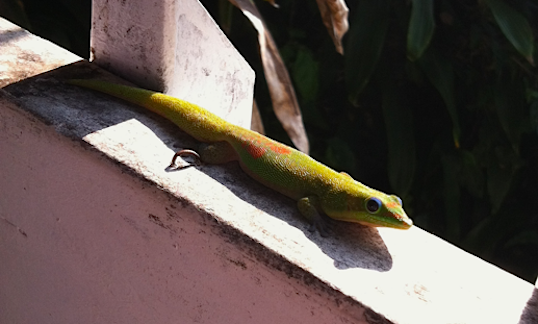 I wondered if the lizard knows that it’s changing color? When the lizard is green, does it know it? More importantly, does the lizard actively “work” to change his color, or does he “automatically reflect” the color he’s standing over? Does he have to think about it before doing it, or does is just happen while he’s walking around? While I’m certain that there is a Wiki entry someplace in need of my perusal, and a scientist’s correction, I realized that it doesn’t really matter whether or not the lizard is aware, makes a specific effort, or even understands the physical change that takes place in his life: he just has to let it happen. I spend a lot of time talking and writing about personal responsibility. As a pastor I am consistently reminding people that we have a role to play in “working out our salvation”. Don’t take this to mean that I believe that we “earn” salvation through good works. I fully understand that we are saved by God’s grace “through faith”. I also know that Grace+Faith= Good works. These are all illustrations of the active, personal, work we are called to once we begin to follow Christ, but in some way I find myself often missing the point that the changes that take place in my life are actually the result of Christ’s work, not my human effort. God is truly calling me to take responsibility for my actions, but I desperately want to take the responsibility for my growth. In these situations, I don’t really want to undergo the process of change , I want to study and understand the process of how “New Creation” begins, and then go tell everybody about it. I want “study and understanding”, not “obedience and experience”. We aren’t very different in that regard are we? Isn’t this one of the reasons that churches struggle to staff their Children’s Ministries with volunteers, but Bible Studies and sermons are well attended? Looking at the lizard made me realize that understanding “how” my spiritual growth happens doesn’t really matter as much as my submission and obedience to God does. Am I willing to do what he asks me, when he asks me? Am I willing to run around “changing color”, unaware of how the process works, yet grateful for the experience that obedience brought in to my life? If that’s the case, then I’m not “highlighting” my Bible because I just found a tasty new bit of information that will revolutionize my understanding of the ancient world, I’m making a note in the margin because I felt God’s word provoke me to a new behavior or obedience that I don’t want to forget or miss out on. In the end it won’t really matter if I understand or even notice the changes that are taking place in my life, because it’s not my responsibility to make myself a new creation, it’s God’s, and he’s way better at it than I’ve ever been or will be. It’s just my responsibility to be obedient, and be whatever “color” I’m supposed to be. That’s hard enough work already isn’t it?